Marvin V. Rush, ASC on the set.. The seventh entry in our 12-part retrospective series documenting 50 years of production and post on the Star Trek franchise. Here, cinematographer Marvin V. Rush and visual effects supervisor Robert Legato detail their approach to the Trek series reboot in this archival interview. Both later became ASC members. Throughout the annals of the United Federation of Planets, intergalactic intelligence reports have never indicated that Klingons are gourmands with a taste for 20th-century California cuisine. Trekkies need not fear that the show’s writers have gone into orbit; the speaker, in full Klingon prosthetics, is actually actor Michael Dorn, taking a brief break from his morning’s work on Star Trek: The Next Generation. 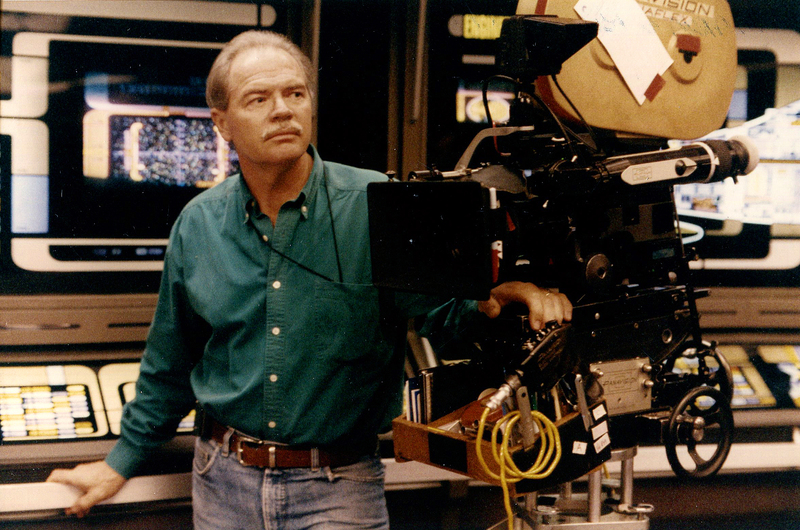 Behind his imposing frame, cinematographer Marvin Rush [ASC] is directing the crew on Paramount Pictures’ Stage 9 through a subtle series of lighting adjustments. 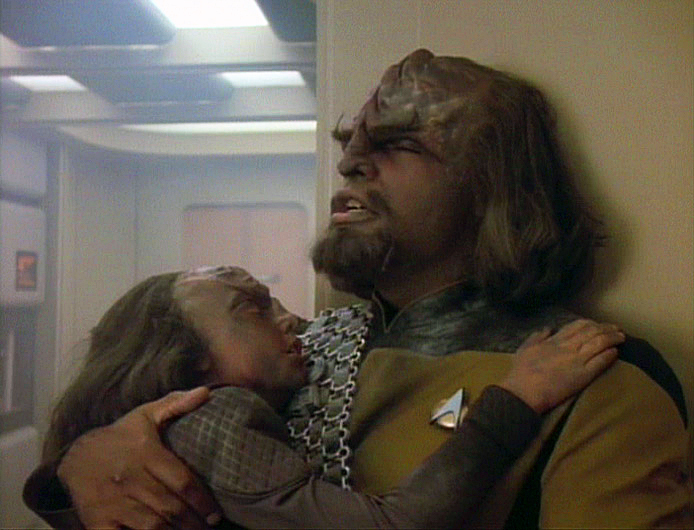 From the Trek episode "New Ground." That work ethic seems to have permeated the entire Star Trek hierarchy, from its late admiral, creator Gene Roddenberry, to its industrious ensigns. Currently in its fifth season, Next Generation has just kept improving, setting new production standards for televised science fiction while adding viewers with each new episode. The plaudits have been earned the hard way; after all, Roddenberry and Paramount Pictures gave themselves a tough task in attempting to resurrect the most beloved science-fiction series in television history. “[Executive producer] Rick Berman said something a while back that was right on the money. He said that what we’re doing, if we’re not careful, can look very, very silly." Indeed, Rush was nominated for an Emmy this year for his work on an episode titled “Family.” The recognition was gratifying, especially considering that the cinematographer’s prior, visually striking work on the NBC sitcom Frank’s Place ended abruptly when the show was cancelled after one season. Although Frank’s Place was not widely seen, it was appreciated by a few who mattered: namely, Next Generation producers Rick Berman and David Livingston. When the pair began looking for a new cinematographer for their own show, they called on Rush, who had moved on to another NBC sitcom, Dear John. Rush prepared a tape of clips from Frank’s Place, but found that a screening was hardly necessary. Rush admits that he doesn’t qualify as a Trekkie. When he accepted the job on Next Generation, he had never even seen the show; moreover, he had never watched a complete episode of the original Star Trek series. What he didn’t know has never hurt him, however; in fact, his lack of familiarity with Kirk, Spock and Scotty may work to his advantage in that he has never felt obliged to pay homage to the original Trek’s look. That imaginative freedom has allowed Rush to compose his own unique vision of the future, which hews to some carefully considered criteria. “Rick Berman said something a while back that was right on the money,” Rush relates. “He said that what we’re doing, if we’re not careful, can look very, very silly. We’re riding through space in funny suits, in this funny ship, and we’re creating aliens. There are a lot of things about it that could come off as very silly. If you do a lot of really over-the-top things with lighting and photography, you can push it over into the comic-book realm real fast. So it’s important to believe that it’s real in your own mind. I assume that this is really happening; it’s not a comic book to me, it’s 100 percent real. That’s why I favor source lighting; if you play source, the believability goes up, because source is what you see. If you use really garish colors, which I have on occasion, you try to moderate them so they don’t look like a rock concert. God forbid it should look like a rock concert – that’s not the appropriate tone for this! We try to play things a little more straight. Rush keeps these theories in mind on all of the various Enterprise sets, from the sick bay to the bridge. “The Enterprise is a fairly ‘up’ and inviting place,” he notes. “That way, when the ship has problems, we can show that by having the lights go dark or by using flickering lights or a flashing color of some kind when there’s an explosion. The ship is often in jeopardy, and if you start out with everything wonderful, and not moody, you have somewhere to go when things go bad. I have a non-filtered look on the Enterprise sets. When we’re on the ship, it’s clean; we use filters very infrequently. This approach provides me with some headroom. The lounge scene in “New Ground” provided a good look at some of the innovative set pieces designed to help Rush achieve his favored look. The most striking props in the Enterprise’s lounge area are its intimate tables, which feature futuristic-looking, glowing surfaces that Rush can exploit for ambience. Rush emphasizes that he tries to fit his photography into the parameters inherent to the individual sets. “I try to establish something in a wide shot that gives the viewer a feeling and a flavor, based on the set design. You can’t light away from the sources because they’re part of the look of the set. I try to let the set dictate a lot, and I like the scene to dictate quite a bit as well. If there are no sources established in the scene, then I create some. The bridge is an example of a set that’s very ambient; it’s got this big dome over it, and it dictates a fairly ‘up’ look. I could do it ‘down,’ but I think that would be lighting away from what the set does. While Rush’s various rules of thumb have helped make Next Generation one of the most visually distinctive shows on television, they occasionally cause him Jupiter-sized headaches. The main source of his anxiety has generally been the reflective black plexiglass panels that line many of the ship’s corridors and set pieces. “When I first came onto the show, I took one look at the instrument panels on the bridge and realized that I was in the middle of a cameraman’s worst nightmare,” Rush chuckles ruefully. “There are a lot of reflection problems because it’s a hall of mirrors in the background. We just don’t accept reflections of equipment, lights, microphones or any of that stuff. It’s a point of pride, and there have been very few occasions when they’ve gotten by us. But it took a bit of time to figure out how to beat the reflections. We have so many reflective surfaces on the sets that if you put up a light and you have to put up four flags, it opens up a whole new realm of problems; the flags mounts are shiny chrome, and you have to black-tape the chrome of the C-stands. It’s almost as if it doesn’t work anymore because you have to work so hard just to put one light up. “When the camera is directly reflected,” he says, “we can take [the camera] down so it’s very dark. So even though it’s in a reflection, because it’s dark and the characters are light it’s not seen. The panel is in the background, and what little reflection that remains is masked by distance, brightness and foreground action. The director of “New Ground,” industry veteran Robert Scheerer, confirms that the director/cinematographer relationship on the show is clearly defined and a major key to getting good results. “The director does get totally involved with camera placements,” he maintains. “I basically come in with a plan about where to put the camera, where to move the camera, and where to cut. That doesn’t mean that Marvin isn’t very creative and doesn’t offer suggestions. The relationship between the director and cinematographer is very important. It can make the experience very unhappy if you don’t have a good relationship. If the combination works, you get so that you’re talking in shorthand after a while, which is a great help. Aside from the practical challenges caused by the show’s schedule, Rush must also tailor his work to fit the needs of Star Trek’s special effects wizards. These considerations can affect his framing and lighting choices but Rush has developed a cooperative and constructive rapport with the show’s effects men. The show’s visual effects have received stellar marks from viewers, thanks to the efforts of the two teams. Rob Legato and coordinator Gary Hutzel comprise one unit, while Dan Curry and his second, Ron Moore, handle the show on an alternating basis. To speed up that process, Star Trek’s postproduction team at Unitel in Hollywood has taken advantage of the AatonCode system, which is used in conjunction with Panavision Panaflex cameras. A time code is added to both the film and the sound rolls during filming via Aaton’s “video linker” device; in postproduction, the code is recovered from the film and used to sync the audio with the visuals, making the entire exercise smoother and faster. Despite such innovations, Curry reports that some orders stretch the visual effects teams to their limits. 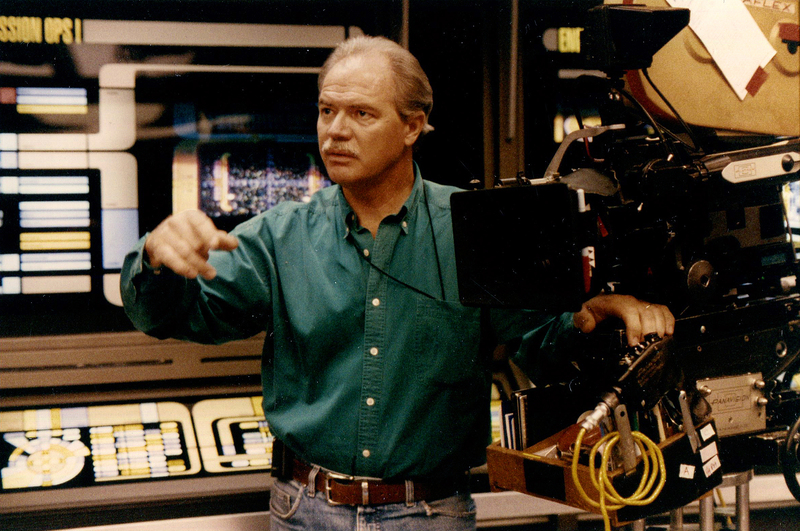 Legato is also a proponent of the newest digital technology for effects, which he cites as one reason the crew is able to keep to its rigorous schedule. “Everything we shoot on the show is generated on film, mostly to maintain the same look. I shoot everything at 24 and try to make it match so it still feels like film quality when you go from Marvin’s footage to my footage. Then we transfer that to tape and do all of our work on D-1. It starts out as digital tape and never goes down a generation after it’s transferred. Only when it gets cut back into the show does it go back to analog. It’s as pristine as we can make it. There are a lot of advantages to D-1 as opposed to the way we used to do it. Now we can make some settings, say color settings, give it an additional glow, record those settings, come back 10 years later, press those numbers in and match into it identically. You just turn the knob to number 7 and it’s going to be that way week after week after week. That is a great innovation for us. In addition to the more standard tricks, Star Trek’s legerdemain department has also pulled out the stops from time to time. For the spectacular shots of the Enterprise “stretching” into warp speed (seen weekly during the opening credits), the team has borrowed the “slit-scan” process introduced during the Star Gate sequence in 2001: A Space Odyssey. “ILM did three original shots where the ship stretches out, and we did two for an episode that I directed,” says Legato. “You photograph the artwork through a slit that scans from the left edge to the right edge. Basically, in one frame, if you shot it this way, it would scan on the whole piece of artwork. You take that and introduce a camera move so that as the slit is moving across the artwork, the camera is moving back at the same time. It appears to take the object and tip in perspective; in the Star Gate sequence, it looks like it was shot with a 10 millimeter lens and stretches out into infinity. Then you take that, and besides the slit moving you move the artwork as well, so now you have this thing that’s running through at what appears to be a rapid rate. This article originally appeared in American Cinematographer, January, 1992.